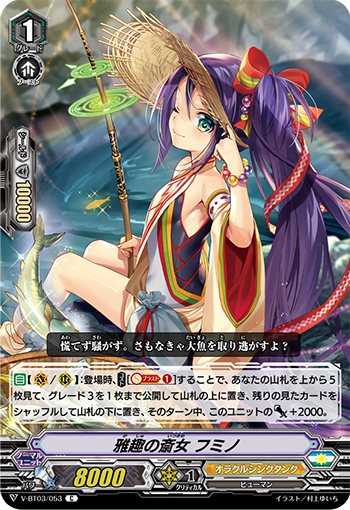 Two new commons are revealed for Oracle Think Tank, a Miko and a Magus. [AUTO](VC/RC): When placed, COST [Soul Blast (1)], look at five cards from the top of your deck, reveal up to one grade 3 from among them, put it on the top of your deck, shuffle the rest of the cards you looked at, put them on the bottom of your deck, and this unit gets [Power]+2000 until end of turn. [AUTO]: When placed in your trigger zone, if your vanguard is grade 3 or greater, COST [Soul Blast (1)], and Counter Charge (1).